The Third Avenue Garage is located between Wood Street and Stanwix Street with easy access and entrances and exits from both Third (one way traffic north) and Fourth Avenue (one way traffic south). It is adjacent to PPG Place, YWCA, the Library Center, and one block from Market Square and a short walk to Heinz Hall and the O'Reilly Theater. Also, it is but a short walk to the North Shore and PNC Park and Heinz Field. Check out the Bike Station on the first floor of the garage. The garage is located within walking distance of Market Square Place, where you will find a variety of restaurants, outdoor cafes, street vendors, afternoon entertainment and evening events.It is two short blocks from the internationally known PPG Place and Plaza, designed by Philip Johnson and John Burgee of New York. With its expansive and venitian plaza and spiraling roof peaks, "The Glass Castle" is a must-see for anyone visiting the City. In the winter PPG Place Plaza is converted into an ice skating rink similar to but larger than Rockefeller Center in New York. In the spring the plaza is alive with dancing waters and sprays that one can pass through. These ammenities are a true delight for the whole family. Valet parking available upon request. 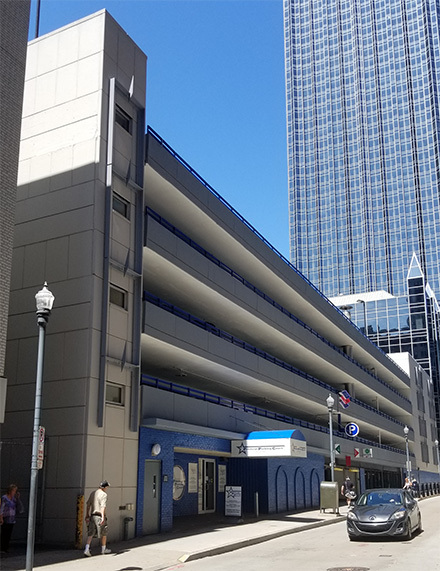 The Third Avenue Garage is located between Third and Fourth Avenues in Downtown Pittsburgh. The garage capacity is 570 vehicles and is open 24-hours a day, 7 days a week. Night Lease $100 per month 4:00 p.m. - 6:00 a.m.
Day Rate- Monday thru Friday, 5:00 a.m. to 3:59 p.m.